This trek is designed to cater for the budget travel, but afford you the safety and cultural value of having a guide with you. You have the freedom to choose your own lodging and fooding, whichever suits your budget. Take a day to rest and recover from your flight, meet with your guide, trip briefing and gear check for the trip. We take an early morning flight to Lukla which is the gateway to the Everest Region. Here we meet our porters if you are hiring them. We walk on a trail that gradually descends to Cheplung village from where we get a glimpse of Mt. Khumbila, a sacred mountain which has never been climbed. From here, we gradually descend until Phakding. From Dingboche we can hike up to Imja for acclimatization, It’s a nice hike through Yak Pastures to the base of the Imja Peak. A long day in the altitude as we head for Everest Base Camp. It’s a gentle ascend and descent, but first we have to climb up the Tuckla Pass. Everest Base camp is our final destination, from here you can see views of Nuptse and Pumori as well as the Ice Fall. Hike back to Gorak Shep. We wake up early for the walk up to Kala Patthar. It is dark outside with cold temperature and most likely chilly winds. We walk on a fairly steep trail at a comfortable pace. As we are climbing up the hill we can see Lingtren, Khumbutse, and Changtse mountains. The view from the summit is outstanding. We can see the world’s tallest mountain Everest along other mighty Himalayan peaks. 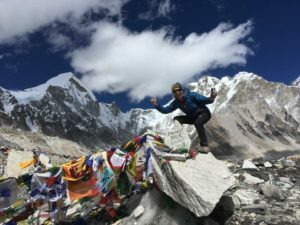 After this we have the options to carry on the Everest Base Camp if you did not get there the day before and then return to Pheriche. It’s a long day. A long undulating walk as we head back into the tree line of Juniper and Rhododendrons. Get our last views of the mountains before we reach to Namche. 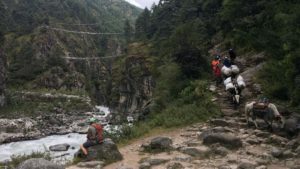 Follow the Dudh Koshi back to Namche. It’s’ mostly downhill. Chill out in Lukla. Fly back to Kathmandu in the morning. A day to spend relaxing in Kathmandu, shopping, sightseeing or getting a massage. Price includes – Airport Transfers, Guide, Flights to Lukla and back, Permits. 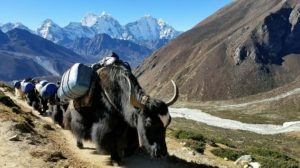 In the case of Meals and Accommodation – it will included for the duration of the trek, twin sharing teahouses and 3 meals per day. Price includes airport transfers, guide, flights to Lukla and back, permits. Does not include accommodations, porter or food. You can estimate $35-$50 per day for food and accommodations. Price includes airport transfers, guide, a porter to carry your gear (lighten the load by only carrying your day pack), flights to Lukla and back, permits. Does not include accommodations, or food. You can estimate $35-$50 per day for food and accommodations. Price includes airport transfers, guide, a porter to carry your gear (lighten the load by only carrying your day pack), flights to Lukla and back, all accommodations, 3 meals per day, and permits. We are booking custom dates for the 2019 season, so get in touch to inquire about the dates you are interested in! Even if you don’t have the minimum for the above pricing, we can try to match you with other guests or give pricing for smaller groups.